MONROE, La. – The University of Louisiana at Monroe Institutional Review Team will be on campus next week to interview various institutional constituencies as well as hold a public forum. The purpose of the review is to identify opportunities and challenges that will aid in the transition to a new president for ULM. The three-person review team has spent the past month reviewing campus materials and conducting phone interviews. The on-campus interviews will be the last information-gathering step before completing the report in October. The team will meet with over 40 individuals in a series of private meetings from Wednesday, Sept. 15 through Friday, Sept. 17. Friday’s public forum will be a chance for anyone not scheduled to meet with the team to voice their opinions. “This is an essential part of the process. In order to understand what is working well at ULM, as well as what its challenges are, it’s critical that we hear first-hand from the people most closely connected to the university,” said ULM Institutional Review Team Leader Gary Reichard. Reichard is the former executive vice chancellor and chief academic officer for the California State University system. Other team members are Aubrey Lucas, president-emeritus of the University of Southern Mississippi, and Portia Shields, former president of Albany State University. Together, the team has 45 years of senior administrative higher education experience. The goal of the review committee is to complete a report prior to semi-finalist interviews for the ULM Presidential Search tentatively scheduled for mid-October. 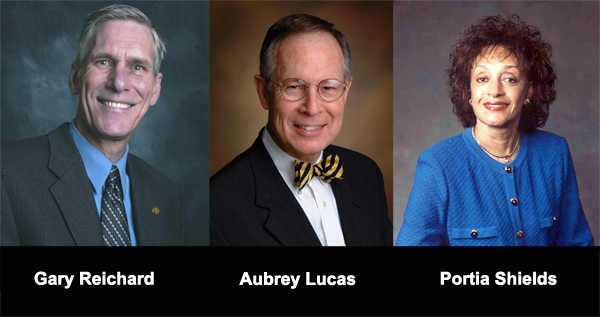 To learn more about the ULM Presidential Search, visit www.ulsystem.edu/ULMSearch. EIGHT UNIVERSITIES STRONG: The University of Louisiana System is the largest higher education system in the state enrolling almost 82,000 students at Grambling State University, Louisiana Tech University, McNeese State University, Nicholls State University, Northwestern State University, Southeastern Louisiana University, the University of Louisiana at Lafayette and the University of Louisiana at Monroe.